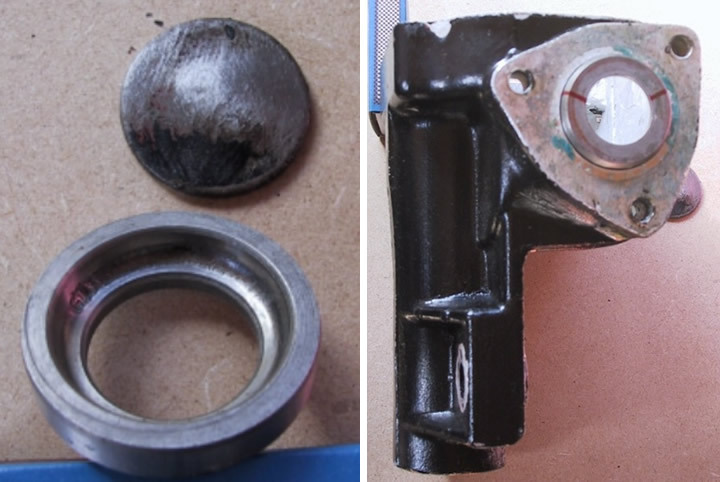 If the end plug falls out (see 2nd picture) of the steering box don’t drive the casting is CRACKED see picture below. 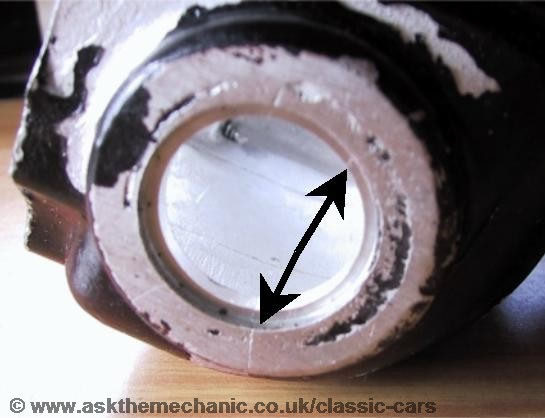 The problem with reconditioning the steering box is that the top bearing outer race is fitted, then the adjustable column is welded on making it very difficult to replace, it is also the bearing to run out of oil first being at the top of the box see the pitting on the race below. My tip although not the best in the world worked for me, I noticed that all the wear on the outer races was on the bottom so when I refitted them I made sure the worn part of the race was to the top (see the picture) so when under load the ball bearings have an un-worn surface to run on. I replaced all the ball bearings (easy to get as the Americans still use inches) and fitted the next size up ‘O’ ring to stop oil leaks. Don’t use any pre-load unless your bearing surfaces are perfect, this unlikely so just shim until there is no perceptible end float, the rocker shaft end float can be set as normal.